You can monitor you child’s activities and they can participate in the extra curricular activities of the schools, such as band, soccer, etc. while you hang with them and make sure they are being treated correctly. You don’t want your child to be socialized the way they will be socialized in the classrooms of a school all day with a bunch of craziness. And if you, the child’s parent, is able to come to the school and visit, even for a little while, the teachers and/or administration act like you are an intruder. What? This is my child! This is a public service establishment, meant to serve us and my child with an excellent, well rounded, proper education. Think again. In homeschooling, your child can attend any music, dance, sport, or any other activity they, or you, would like for them to attend, at anytime you like. Field trips with tons of learning everyday! Mary Ellen school of dance in Ocala is trying to get homeschool cheer,dance,PE,sport acrobatics,competitive tumbling and pre-school movement classes going in the daytime.I would be the teacher and have homeschooled for 9 years.Would you post info or a link or could you tell me where I could? 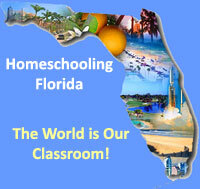 Hi, thanks for visiting HomeschoolingFlorida.com and expressing your interest in promoting your dance school to the homeschool community in the Ocala area. Please forgive us for the delay in responding. We recently added the ability to post listings and buy ad space on the site. The rates are extremely economical.